Fears of an impending global trade war and several other macroeconomic trends had a negative impact on equity capital market activity over the third quarter of 2018, with companies around the globe delaying plans of IPOs or FPOs to avoid choppy market conditions. While this had a negative impact on equity underwriting volumes across regions, a lower-than-average decline in U.S. equity market activity coupled with strong gains by the U.S. dollar helped the five largest U.S. investment banks pocket a bulk of the equity underwriting fees for the period. 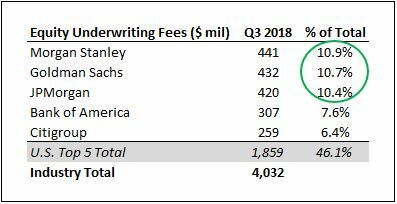 The largest U.S. banks reported $1.86 billion in equity underwriting fees in Q3 2018 – a 45% jump from the figure a year ago, but a 16% reduction sequentially. However, with total equity underwriting fees for all investment banks globally falling at a faster rate (according to data compiled by Thomson Reuters), the wallet share of these banks increased to over 46% for the first time. To put things in perspective, the combined wallet share of these five banks was slightly below 33% for the 12-quarter period from Q2 2015 to Q1 2018. We capture the trends in equity underwriting fees for each of these investment banks over recent years in detail as a part of our interactive model, while also forecasting how this revenue is likely to change in 2018. We highlight key observations related to their equity underwriting fees below. The table below details the trends in equity underwriting fees for each of these banks in the last five quarters. The green-to-yellow shading along a column highlights the relative performance of each bank in any given quarter. While these banks have a strong grip over the industry, with a wallet share of 33% in global equity capital markets, this figure has been in excess of 40% in each of the last two quarters due to the aforementioned factors. Total equity underwriting fees for the industry are taken from Thomson Reuters’ latest investment banking league tables. Figures for individual banks are reported as a part of their quarterly results. Notably, there was little difference between the reported equity underwriting fees for the top 3 players in the list, with each of them reporting a wallet share of around 10.5%. This can be attributed to the fact that each of these banks have a very strong presence in the U.S. and Europe, and usually play a part in roughly the same number of equity capital market deals that close in a given quarter. Their relative position for a period is primarily determined by the extent of their involvement in the largest deals that closed over the quarter, as well as gains realized by each bank from over-allotment benefits from the more successful IPOs. This would explain why Morgan Stanley edged ahead in terms of total fees despite ranking #3 in terms of total equity underwriting deal volume for Q3.